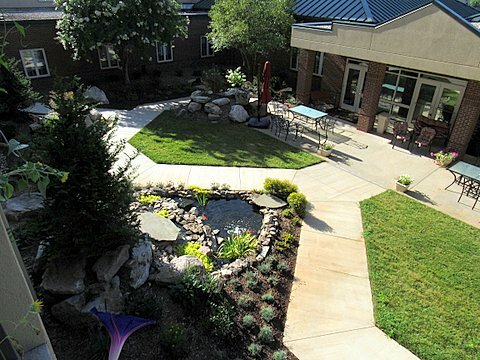 Grace Ridge Friendship Garden: Good for the body, therapeutic for the soul - Grace Ridge Retirement Community - Morganton, N.C. These thoughtful remarks and observations by Ron Martin set the serene tone for the recent Grace Ridge Friendship Garden dedication, where more than 75 people gathered under an overcast sky to celebrate a three-year labor of love – and friendship. Designed by Appalachian Naturescapes, the garden complements the peaceful and mountain lodge feel of Grace Ridge and features harvested boulders made of Virginia Fieldstone. It also boasts a variety of colorful and fragrant plants, flowers and trees, including maple, conifer, azalea, camellia and hydrangea. “This project has been in the making for about three years. We envisioned great landscaping in this area and to make it more user-friendly and welcoming for friends and family to gather together,” said Brenda Yost, executive director. More than $50,000 was raised in partnership with the Blue Ridge HealthCare Foundation through memorials and honoraria by and for residents and friends of Grace Ridge. The initial phase of the project started in August 2014, when the sidewalk was widened. Next was the addition of a beautiful koi pond, which was donated by resident Conley Mitchell to honor his brother, Harold. The finishing touches were placed on the garden in early summer. The morning concluded with a touching tribute to Yost’s husband, Danny, who passed away in June. The Grace Ridge management team presented Yost with a wind sculpture that was placed in the garden. Watch the Grace Ridge Friendship Garden Dedication video.